*This blogpost was originally developed by Andrea Testa and adapted by Erica Roggio and Samantha Collins of Bioversity International. An event was held last month as part of Expo Milano 2015: Feeding the Planet, Energy for Life and the European Year for Development, organized by A4NH partner, Bioversity International along with the Italian Development Cooperation. 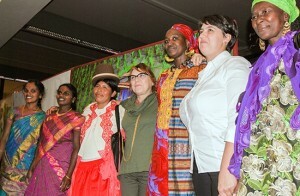 Entitled, Agricultural biodiversity, value chains and women’s empowerment, the event covered a range of important themes. Through the ages, women around the world have selected and stored seeds, made decisions about which foods to collect, grow, buy, or cook for the family table, handed down traditional recipes to their daughters and granddaughters, and acted as custodian farmers safeguarding and using agricultural biodiversity. Ensuring women have equal opportunities to access resources, such as quality seeds and equipment, is fundamental and not just a matter of social equity. According to the United Nations, strengthening women’s capacities would increase agricultural productivity and the diversity of what we eat, and can go a long way towards meeting 2015 Sustainable Development Goals on poverty, hunger, and sustainable agriculture. Increasingly the global community is recognizing the importance of diet diversity for nutrition, as detailed in ‘Connecting Global Priorities: Biodiversity and Human Health’ published earlier this year by the Convention on Biological Diversity and the World Health Organization, with support from A4NH and two chapter contributions by Bioversity International. Ensuring that women have equal access to markets for diverse local foods is also imperative for food and nutrition security. Value chain approaches have been widely used in international development, including CGIAR, to enhance livelihoods of food producers, but more recently, new research (including some led by A4NH) is bringing a nutrition lens and consumer focus to value chains. These important themes were discussed in the side event at Expo Milano 2015, Agricultural biodiversity, value chains and women’s empowerment, at which women farmers and international and local development actors gathered together to exchange experiences on how using agricultural biodiversity can improve livelihood and provide sustainable, nutritious foods for families and communities. From India, Malliga Seerangan and Jayalaitha Eswaran explained how nutritious and resilient millets had disappeared from fields and diets, replaced by rice. Bioversity International and partners have worked with rural women in several project sites to re-introduce and commercialize minor millet varieties: their net income increased by 50%, and millets is now back in school canteens with health benefits for children. From Bolivia, Sebastiana Choque explained how the country has led the way in officially recognizing the role of custodian farmers, many of whom are women, as key contributors to the conservation of biodiversity, food and income security. We also heard how Andean grains, which have a high nutritional value and are resistant to extreme weather events, are now back in the fields and their consumption has increased in areas targeted by the project. How? By enhancing women’s knowledge, introducing processing machinery and improving connections with distribution channels and urban consumers. From Mali, Aminata Ouattara moved the focus away from food crops, as we heard how an association of herbalists has found its place in city markets, thus ensuring a future for medicinal plants and traditional medicine, again, led by women. Finally, we came to Italy, where Catuscia Sissa told her story of how women have been instrumental in saving native species, such as solina wheat, in the Majella National Park, Abruzzo. 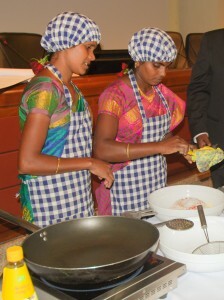 After hearing the farmer stories, the finale of the event was not to miss – when the farmers cooked their traditional dishes for everyone to try, showing that agricultural biodiversity is not just nutritious, but delicious as well.